Hydrozoa is a diverse and wide-ranging taxonomic class (sometimes superclass) of marine and freshwater invertebrates within the phylum Cnidaria, whose members are characterized by a life cycle that always includes the presence of planula larva, and the medusa, if present, having a velum, or muscular projection from the subumbrellar margin. Hydrozoans generally display alternation of generations between polyp and medusa, although hydras exhibit only the polyp form and some species are represented only by medusae and lack the polyp stage. Hydrozoans are carnivorous animals that can be solitary or colonial. Most are small (an umbrella of less than 50 millimeters or two inches), but some can be large (40 centimeters or 17.7 inches), and some colonies can be very large (30 meters or 98 feet). Hydrozoans include marine hydroids, freshwater hydras, some known as jellyfish and corals, and the well-known Portuguese man-of-war (or Portuguese man o' war). While the often small and diaphanous hydrozoa, as polpys or medusae, often go unnoticed, they are important in aquatic food chains. Hydrozoans capture crustaceans, among other appropriately sized animals, with the medusae sometimes feeding extensively on fish eggs and larva, and these invertebrates are preyed upon by various fish, crustaceans, and mollusks. While the characteristic cnidarian stinging structures known as nematocysts provide protection from many predators, some sea slugs are able to appropriate the nematocysts for their own defense. For humans, the hydrozoans add greatly to the wonder of nature, and illustrations, such as those by Ernst Haeckel, are renowned for their beauty. Hydra is among those hydrozoans that are common in scientific research. However, some hydrozoans tend to clog the pipes of power plants, increase friction on ships they have attached to, or are pests in aquaculture. And the medusae of species like the Portuguese man o' war (Physalia physalis)—a siphonophore colony of four kinds of specialized polpys and medusoids—can inflict severe stings on humans. Cnidaria, the phylum to which Hydrozoa belongs, contains some 11,000 species of relatively simple invertebrate animals found exclusively in aquatic, mostly marine, environments. Cniderians include corals, sea anemones, jellyfish, sea pens, sea pansies, sea wasps, and tiny freshwater hydra. The name of the phylum comes from cnidocytes, which are specialized cells that carry stinging organelles. These are sometimes listed as superclass, rather than class. In the idealized life cycle, members of Cnidaria alternate between asexual polyps and sexual, free-swimming forms called medusae (singular medusa). However, the Anthozoa live only as polyps, while Scyphozoa live most of their life cycle as medusae. 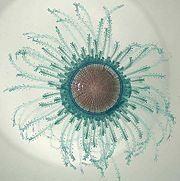 The Hydrozoa live as polyps, medusae, and species that alternate between the two (Towle 1989). Invertebrates belonging to the class Cubozoa are named for their cube-shaped medusae, which form the dominant part of their life cycle. The non-anthozoan classes may be grouped into the subphylum Medusozoa. In the idealized life cycle, during sexual reproduction, a larva (or planula) forms from the blastula. The larva have flagella and swim until it encounters a firm substrate, on which it anchors itself and then passes through metamorphosis to the polyp stage, if present. The polyp may be solitary or form colonies by budding. Medusae are produced from the polyp and swim freely and produce eggs and sperm. However, there are many variations from this life cycle. Hydrozoa is a very diverse class with members that vary considerably from this idealized life cycle. The life cycle does always include the presence of planula larva, which is essentially a ciliated, motile gastrula, more an embryo than larva (Boero and Bouillon 2004). However, among many in Hydrozoa, the medusae remain on the polyps in a reduced form, known as gonophores. A few hydrozoans, such as the hydra, have no medusa stage whatsoever; instead the polyp itself forms male or female gametes. And in many hydrozoans, there are no polyp stage (Boero and Boullon 2004). The main characteristic that distinguishes the medusae of members of Hydrozoa from that of other classes is the presence of the velum, which is a muscular extension of the subumbrellar margin that allows the subumbrellar cavity to be partially closed (Boero and Boullon 2004). The umbrella of hydrozoans commonly ranges in diameter between just 0.5 millimeters (0.02 inches) and 50 millimeters (two inches), but in many species the size is larger, reaching up to ten to 20 centimeters (3.9-7.9 inches) in Aequorea and up to 40 centimeters (15.7 inches) in Rhacostoma atlanticum. The smallest polyps range from only 20 to 480 µm. Most colonies have reduced size of a few centimeters, but some can be large, such as Corymorha nutans (12 centimeters or 4.7 inches) and up to Apolemia uvaria, whose colonies reach 30 meters (98.4 feet) (Boero and Bouillon 2004). 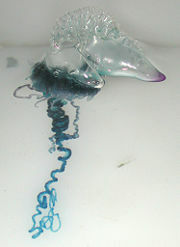 Most medusae and polyps are diaphanous, but colored species exist. Often this is reddish, derived from consuming crustaceans (Boero and Bouillon 2004). Some examples of hydrozoans are the freshwater jelly (Craspedacusta sowerbyi), the freshwater polyps (Hydra), Obelia, the Portuguese man o' war (Physalia physalis), the chondrophores (Porpitidae), "air fern" (Sertularia argenta), and the pink-hearted hydroids (Tubularia). Hydrozons are found in water masses all over the world, including marine and freshwater. Medusae are mostly planktonic, but some can be benthic. Polyp stages are usually benthic, but some, such as Velella velella are planktonic (Boero and Bouillon 2004). Hydrozoans occur in all aquatic habitats, including deep sea trenches, lakes, ponds, anchialine caves, and the spaces between sand grains, and many live on other organisms such as fishes, tunicates, polychaetes, mollusks, sponges, algae, and crustaceans. These later symbiotic relationships may be parasitic or involve mutualism or commensalism (Boero and Bouillon 2004). Polpys and medusae are both mostly carnivorous and feed on animals of appropriate size. They commonly feed on crustaceans, such as copepods. Medusae are voracious predators, which are at the apex of food chains when consuming fish eggs and larvae. Polyps are generally more varied in diet and some feed on a wide variety of prey. Some have a symbiotic relationship with zooxanthellae and are functionally photosynthetic. Carnivores used cnidocytes to capture their food (Boero and Bouillon 2004). Most members of Hydrozoa have separate sexes and fertilization is internal, but without copulation. In some, the males spawn in the water and the sperm swim actively toward the eggs on the female (medusae or polyp colony). For many species with medusae, both females and males spawn in the water. Eggs can be small and in large numbers or large and few, depending on the species. In some species, the dominant reproduction is asexual reproduction of the polyp stage (Boero and Bouillon 2004). Medusae tend to be markedly individual and even when swarms are formed by winds or current it is not known if there is any social interaction. The colonial Hydrozoa share complex functions and have been compared to superorganisms. The zooids of a colony typically derive from a single planula (Boero and Bouillon 2004). Some colonial hydrozoans have both a medusa stage and a polyp stage in their life cycle. Each colony has a base, a stalk, and one or more polyps. Hydroid colonies are usually dioecious, which means that they have separate sexes—all the polyps in each colony are either male or female, but not usually both sexes in the same colony. Hydrozoan colonies are composed of a number of specialized polyps (or "zooids"), including feeding, reproductive, and sometimes, protective zooids. In some species, the reproductive polyps, known as gonozooids (or "gonotheca" in thecate hydrozoans) bud off asexually-produced medusae. These tiny, new medusae (which are either male or female) mature and spawn, releasing gametes freely into the sea in most cases. 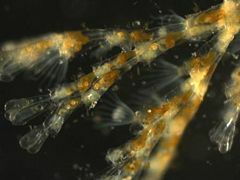 Zygotes become free-swimming planula larvae or actinula larvae that either settle on a suitable substrate (in the case of planulae), or swim and develop into another medusae or polyp directly (actinulae). Colonial hydrozoans include siphonophore colonies, Hydractinia, Obelia, and many others. The medusa stage, if present, is the sexually-reproductive life cycle phase (that is, in hydrozoan species that have both polyp and medusa generations). Medusae of these species of Hydrozoa are known as "hydromedusae." Most hydromedusae have shorter life spans than the larger scyphozoan jellyfish. Some species of hydromedusae release gametes shortly after they are themselves released from the hydroids (as in the case of fire corals), living only a few hours, while other species of hydromedusae grow and feed in the plankton for months, spawning daily for many days before their supply of food or other water conditions deteriorate and cause their demise. Hydrozoan systematics is highly complex. Several approaches for expressing their interrelationships were proposed and heavily contested since the late nineteenth century, but in more recent times a consensus seems to be emerging. For long, the hydrozoans were divided into a number of orders, according to their mode of growth and reproduction. Most famous among these was probably the assemblage called "Hydroida," but this group is apparently paraphyletic, united by plesiomorphic (ancestral) traits. Other such orders were the Anthoathecatae, Actinulidae, Laingiomedusae, Polypodiozoa, Siphonophora, and Trachylina. As far as can be told from the molecular and morphological data at hand, the Siphonophora, for example, were just highly specialized "hydroids," whereas the Limnomedusae—presumed to be a "hydroid" suborder—were simply very primitive hydrozoans and not closely related to the other "hydroids." Therefore, today the hydrozoans are at least tentatively divided into two subclasses, the Leptolinae (containing the bulk of the former "Hydroida" and the Siphonophora) and the Trachylinae, containing the others (including the Limnomedusae). The monophyly of several of the presumed orders in each subclass is still in need of verification (Schuchert 2005). The Integrated Taxonomic Information System (ITIS) uses the same system but unlike here does not use the oldest available names for many groups. In addition, there exists a unique cnidarian parasite, Polypodium hydriforme, which lives inside its host's cells. It is sometimes placed in the Hydrozoa, but actually its relationships are better treated as unresolved for the time being—a somewhat controversial 18S rRNA sequence analysis found it to be closer to Myxozoa. It was traditionally placed in its own class Polypodiozoa and this view is presently often seen to reflect the uncertainties surrounding this highly distinct animal (Zrzavý and Hypša 2003). Some of the more widespread classification systems for the Hydrozoa are listed below. Though they are often found in seemingly authoritative Internet sources and databases, they do not agree with the currently available data. Especially the presumed phylogenetic distinctness of the Siphonophora is a major flaw that was corrected only recently. Fire corals were initially considered a separate order. They are actually a family of the Anthomedusae. Some incorrectly place the anthomedusan family Porpitidae in a separate order "Chondrophora". The most widely-known and researched freshwater hydrozoan is Hydra, which is found in slow-moving waters. Hydra has a pedal disc composed of gland cells that helps it attach to substrates, and like all cnidarians uses nematocysts, or "stinging cells," to disable its prey. Hydra eat small crustaceans (such as brine shrimp), insect larvae, and annelid worms. Hydra may reproduce sexually, through the spawning of sperm (and thus insemination of eggs on the female body column), or through asexual reproduction (budding). Boero, F., and J. Bouillon. 2004. Hydrozoa. In B. Grzimek, D.G. Kleiman, V. Geist, and M.C. McDade. 2004. Grzimek's Animal Life Encyclopedia. Detroit: Thomson-Gale. ISBN 0787657883. Schuchert, P. 2005. Hydrozoa Also Hydrozoan phylogeny and classification The Hydrozoa Directory. Retrieved December 19, 2008. Zrzavý, J., and V. Hypša. 2003. Polypodium, and the origin of the Bilateria: The phylogenetic position of "Endocnidozoa" in light of the rediscovery of Buddenbrockia Cladistics 19(2): 164–169. Retrieved December 19, 2008. This page was last modified on 22 January 2018, at 20:08.